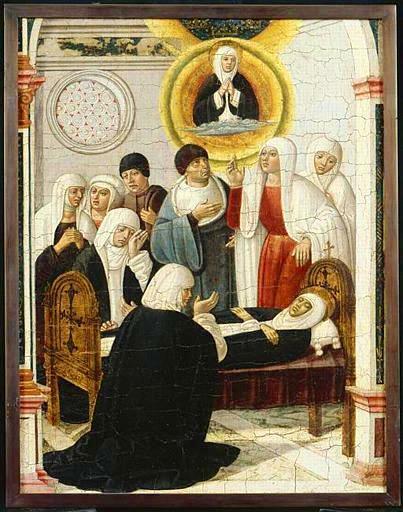 Men and women, possibly Mantellate women surround Catherine at her death. The Mantellate is a group of lay women dedicated to the Dominican Order. They helped the sick, fed the poor, and wore the habit of the Dominicans, black for humility and white for innocence. However, they were not nuns. They were free to roam the city, live at home, and maintain their inherited monies. Catherine joined the Mantellate after much debate between her mother, Monna Lapa, and the Sisters of the Mantellate. This group consisted of widowed women, not virgin girls, Raymond describes their hesitation to allow her to join. Her mother was also greatly opposed to the group, as it meant that she could not marry Catherine to a suitable husband.